The new ethnographies of literacy tell us that people can lead full lives without the kinds of literacy assumed in educational and other circles. The reconceptualization of literacy suggested there involves moving away from the dominant view of literacy as having distinctive ‘autonomous’ characteristics associated intrinsically with schooling and pedagogy. It also entails a shift away from the characterization of the literate person as intrinsically civilized, detached, logical, and so on in contrast with ‘illiterates’ or those who communicate mainly through oral channels. If the qualities of logic, detachment, abstraction conventionally associated with the acquisition of literacy turn out to be available in oral discourse, as Finnegan … and others have amply demonstrated, or rather in some mix of channels that does not require the conventions and rules usually associated with literacy-in-itself, as we have been suggesting here, then literacy loses some of the status and mystification that currently underpin the investment of vast resources in both teaching and measuring it. How, then, can we explain the almost obsessive attention to literacy in American society, and why is literacy assumed to be ‘functionally necessary’ there? One possible answer, suggested by our analysis here of the pedagogization of literacy, is that the language of ‘function’ disguises and effectively naturalizes the ideological role of literacy in contemporary society. The pedagogized literacy that we have been discussing becomes, then, an organizing concept around which ideas of social identity and value are defined; what kinds of collective identity we subscribe to, what kind of nation we want to belong to, are encapsulated within apparently disinterested accounts of the function, purpose and educational necessity of this kind of literacy. 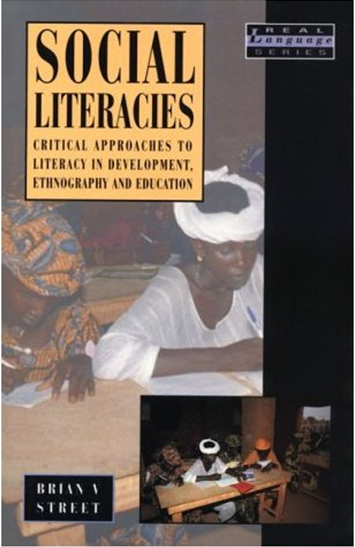 Literacy, in this sense, becomes a symbolic key to many of the society’s gravest problems: issues of ethnic identity, conflict, achievement (or underachievement) can be diverted into accounts of how literacy acquisition can be improved and the distribution of literacy enhanced; issues of poverty and unemployment can be turned into questions about why individuals failed to learn literacy at school, or continue to refuse remedial attention as adults, thus diverting blame from institutions to individuals, from power structures to personal morality; issues concerning the effectiveness and achievement of American society as a whole … are located within a framework of educational debate about reading and writing, again diverting attention away from the institutional explanations for budget deficits, space programme failures and productivity declines. All of these issues become focused within a single, overdetermined sign—that of literacy. The signification of literacy has, then, to be decoded not simply in terms of a discourse around education—school quality, teacher performance, testing and evaluation, approaches to writing instruction, and the like—but in terms of discourses of nationalism: it is around the concept of nation and national identity that the social issues currently diverted into the literacy debate essentially focus. To understand the uses and meanings of literacy, then, we need to analyze their relationship to contemporary nationalism. Indeed, much of the debate about literacy ‘standards’, … highlighted in the work of Hirsch and Bloom … in the USA, does make explicit as well as implicit reference to nationalism. Hirsch, for instance, bases his concept of ‘cultural literacy’ upon the idea of ‘a shared national standard’. He likens the hard-won uniformity in economic laws and interstate commerce to the ‘literacy uniformity’ that is crucial to the formation and underpinning of the nation: ‘The two kinds of uniformity are closely allied’ (Hirsch, 1988). Which culture is to provide the model for such homogeneity and which cultures are to be marginalized within this hegemony is not spelled out: it is presented as a question simply of function rather than of power struggles between competing cultures. The question of which literacy is to provide the standard and which literacies are to be marginalized is similarly disguised beneath the discourse of technological need and institutional necessity. And yet, behind their appeal to apparently neutral forces, Gellner and Hirsch make it quite clear that they have in mind a specific culture and a specific literacy—that of their own subculture. The assumed agreement about what constitutes literacy serves to naturalize their own ideological position: it appears not as an argument in favour of their own preferred kind of literacy and culture but as a given fact of modern life, a necessity by which we are all driven. To question their claims would be to undermine the success and achievements of the nation, to challenge its very identity. Within this discourse, an appeal for cultural plurality and literacy variety appears to be a recipe for chaos.